Hi there, we are Dutch Delight. We live life with pride and passion. We embrace life and we stand tall. We believe that being fit and healthy is the foundation for a happy life. We like to be active and energetic. We are responsible, respect our body and take good care of ourselves. Our base-line attitude is positive: we take joy in life. We also believe that only ambition can change the world. We are ambitious and challenge whenever we see opportunity for improvement. We are persistent and work hard to make these changes. And, to be honest, we are proud of the results of our hard work. This is what we believe. This is what we do. This is what we encourage others to do. One day, our founder, after he had been working out, walked past the changing room mirror in his undies. He noticed how awful his boxer-brief actually looked. The elastic band is simply runs horizontally destroying the body’s natural beauty. Clearly something that can be improved. That is why we offer comfortable and stylish bodywear that is designed to emphasize the natural beauty of a well-trained and well-cared-for body. 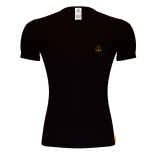 Sophisticated garments that make you look great and feel comfortable, even when you are working out.